MUMBAI: It is the world television premier of one of the biggest blockbusters and Set Max is doing it in style. Sony Entertainment Television network that had recently added a horde of movies to its library has been going gung-ho with its marketing for the world television premier of Aashiqui 2. The musical blockbuster premieres for the first time on the movie channel on 28 July. “We have retained the essence of the movie, which is romance and music, while marketing it to our audiences. Through the marketing initiatives undertaken, we are trying to recreate and refresh the blockbuster movie amongst the viewers,” informs Multi Screen Media head of marketing Vaishali Sharma. The marketing plan which spans over 15 days prior to the telecast and covers Mumbai and Delhi captures the mood of the movie, using different mediums. The lead actors of the movie Aditya Roy Kapoor and Shraddha Kapoor have been roped in to shoot promos for on-air contests, digital contests, YouTube promos, on-air-main-day date-time-and-coming-soon promos as well as three contest questions and winner announcement bytes that will play during the movie. The actors have also posed for Facebook love top stills. “The actors are personally inviting people to see the movie on Max and also to take part in the digital contests. We have also used them to motivate people to send their Aashiqui photos and moments,” adds Sharma. The best photo amongst the lot will feature on the channel on the movie‘s telecast date. The musical blockbuster raked in the moolah (Rs 78.3 crore) at the box office in the domestic market. The channel has built its marketing campaign around the hype and response the movie had received during its release. 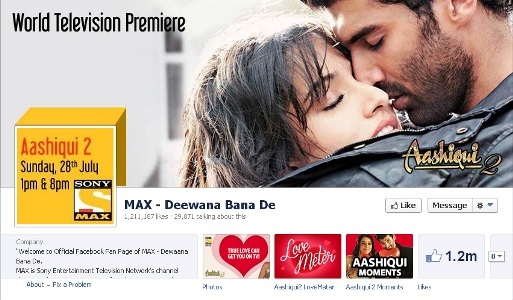 Set Max has created one promo each for broadcast channels, YouTube channel, Facebook and the on-air contest. Special promos of the movie were also shot and screened during the screening of Bhaag Milkha Bhaag and Ramaiya Vastavaiya in both multiplexes and single screen theatres across Mumbai. “It is a youth centric movie. Though strategically we are reaching out to the larger audience base, we have innovatively also reached out to the youth through our innovative marketing strategy,” she adds. Set Max has also taken television slots in various youth centric music channels. “To attract the young audiences, we will also have a contest which will run during the movie, the winner of the contest will get a chance to go on a dinner date with the lead actors,” informs Sharma. On the OOH platform, executed by Storyboard Brandcom , the channel has built its marketing strategy on the theme ‘romance’. “We realised that the music of the film was a big hit. With this in mind, around ten bus shelters across Mumbai are planned to be converted to musical bus stands, playing Aashiqui 2 music to attract audiences. The activity will be done three to four days prior to the telecast date,” she says. For on-ground promotions, the team will hold activities like ‘Give a rose to person you love’ outside National College in Bandra, Mumbai. While the dry run of the activity was held on 22 July, the final activity will be organised a day before the telecast of the movie. “A big poster of the movie, all covered with roses will be set up outside the college. Youngsters will be asked to stand next to the poster and pluck a rose from the poster and give it to their loved ones. There will be few secret roses which will have dinner vouchers for those participating in the activity,” reveals Sharma. The channel wants to re-create the buzz around the movie and with this in mind it will also have models posing as mannequins on Saturday at Bandstand, in Mumbai. “Models will hold placards about the movie and depict the signature pose of the lead pair from Aashiqui 2. This is being done a day prior to the telecast to attract more people to Set Max on Sunday,” she adds. The Facebook page of Set Max which has 1.2 million followers started daily love tip for its followers, through which fans will be advised on their love life. Also a special ‘Aashiqui 2Lovemeter’ has been created that calculates the love quotient between partners. The channel has a host of advertisers lined up for the telecast of the movie. Line (Android, iOS App) is the presenting sponsor for the movie, while Oral B is the powered by sponsor. The associate sponsors are Aquaguard, Cucumber, Cadbury Dairy Milk Silk, Godrej No.1, Videocon, Red Chief Shoes and Relispray Nitron. The movie will be aired twice on 28 July: first at 1 pm and then at 8 pm. The channel is looking at getting audiences in both the slots, even repeat audiences. The on-air contest will be aired in the 1pm slot, while the winners will be revealed in the 8pm slot. The channel has carved a new space for itself in movie marketing. It definitely has started a trend, but will this effort add on to the GRPs of the channel?The coming Sunday will reveal.